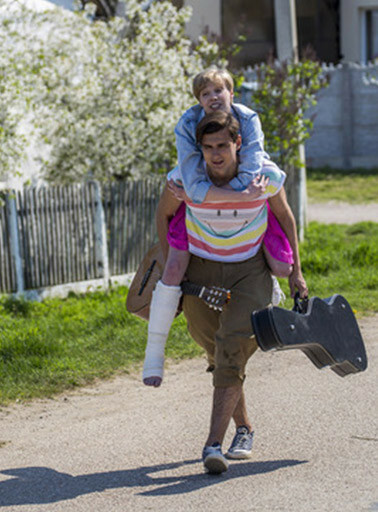 Alyona, the capricious daughter of the successful businessman Khromov, wants to go abroad to a fashionable school of choreography against her father’s will. To put an end to his daughter’s attempts to run off, Khromov, a man of stern temper, decides to marry her. “To the ﬁrst best”, he tells Alyona. This ﬁrst best is the musician Vanya from a vocal-instrumental ensemble. Khromov agrees with Alyona: if within a week the groom runs off, the marriage will not take place and Alyona can go to Berlin to her choreography school. If Alyona runs away from her groom, Berlin is nogo. The bet is sealed. The protagonists go on a journey full of unexpected adventures. Director of theatre and cinema, actor. In 2000, he graduated from the Theatre Department of Sobinov State Conservatory in Saratov as stage and screen actor; in 2008, graduated from the Directors’ Department of the Theatre Institute RATI (GITIS, studio of M. Zakharov). For ten years Dmitri Izmestiev worked as actor at the Saratov Theatre of the Young Spectator, Moscow Theatre of the Young Spectator and Theatre of Film-Actor. From 2007 to 2008 - trainee director at Petr Fomenko’s Workshop Theatre, from 2007 to 2010 - director at the Malaya Bronnaya Theatre. Directed serials Montechristo (2007), People of Shpak (2008), Family Circumstances (2013), Such a Job (2014). Honeyless Moon is his debut in full-length cinema.